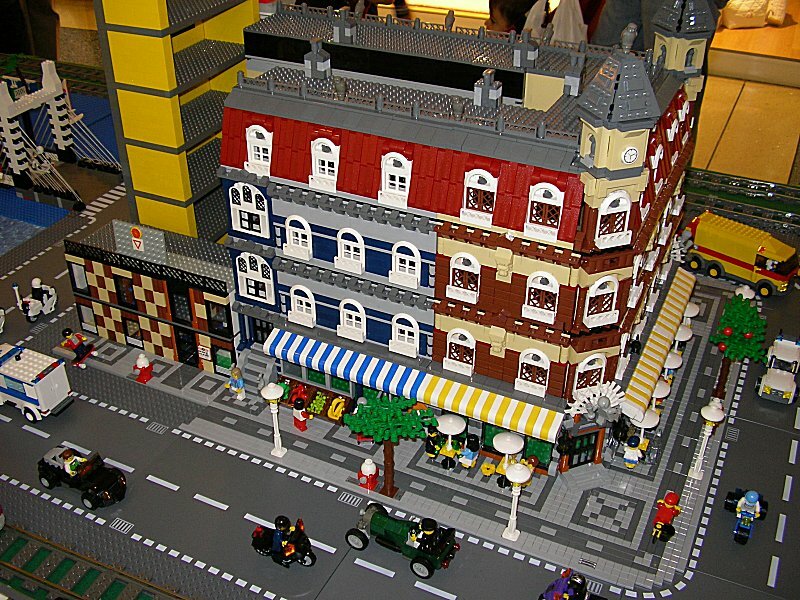 Brick Town Talk: Impressive... - LEGO Town, Architecture, Building Tips, Inspiration Ideas, and more! I wrote it was from AVCampos' gallery. But thank you for the extra information. How are you? Have you built anything new lately? Again, a good example of what I call the roadplate-problem. Their approach was to place the CC houses adjacent to the road baseplates without overlapping, but this increases the sidewalk with another 6 studs. I can see what akos is saying about this problem and I was expecting the pavement/sidewalk to look huge, but I think it looks OK, especially with the cycle path in there. Cycle paths in the UK are Green, so that would give it more variety. I think it gives more room to 'play' with things on the pavement as 8 studs really isn't enough. I was overlapping my CC with my road plates, but think I will change to this method, what do you think? This blog is great, keep it up! I think I will start my own blog with Lego things happening in my life and I hope to post loads of comments on here too.